Best Kamado Grills – Is the Big Green Egg still no. 1? Kamado grills (sometimes known as a Kamado smoker or a Kamado cooker) are one of the fasted growing categories in the outdoor cooking market. They’re based on traditional Chinese and Indian cookers and look like giant eggs or oval urns. They’re very versatile, being able to grill, smoke, roast and even bake pizzas as good as traditional wood fired pizza ovens. If you’re looking for a proper pizza oven, we’ve taken a look at the best wood fired pizza ovens here. The best Kamado Grills are made from ceramics or refractory materials and some from steel. All these materials are incredibly good insulators of heat that can store and radiate heat energy effectively, making them incredibly good all-round cookers. More and more competitors are looking for a piece of the market that The Big Green Egg has mostly dominated for a while so finding the perfect Kamado for you can be a challenge. That’s where we come in. This guide will take you through everything you need to know about Kamado Grills and hopefully you’ll find you the best Kamado grills to suit your budget. The very first clay oven that could be classed as a Kamado grill first appeared in China around 1,000 BC. This knowledge found its way to Japan around 300 BC and that’s when the nameless clay ovens got the name of Kamado, or ‘stove’. At some point in time the design was developed in India and slowly became the tandoor and the Japanese version was developed into a mushikamado that is used to steam rice. After WWII, some of the thousands of American stationed in Japan saw these unique cookers and brought them back. 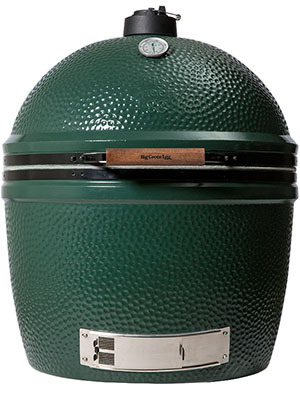 Some even started importing and selling them and finally in 1974 the design was refined and the Big Green Egg was born. The design hasn’t changed much over the 3,000 or so years, they’re still a sort of egg shape stove with either a grill or some form of hanger or plate to place the food. Kamados will generally come with a huge range of accessories that give you many more cooking options, such as pizza stones to make brick oven like pizza. 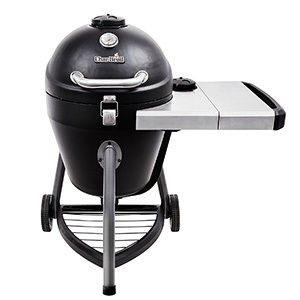 Most Kamado grills now-a-days are made from high quality ceramics, refractory materials or steel. The highly insulative properties of these materials allow them to absorb and store a lot of heat energy which makes them ideal for outdoor cooking at any temperature. They usually look quite striking and unique and can make a great garden feature. After you’ve assembled it you’ll need to find the best fuel possible. It is generally accepted that lump charcoal is superior to briquettes for Kamados and we agree. Check out our complete run down of ‘lump charcoal or briquettes‘ to help you find the best charcoal. You’ll get less ash, they’re generally hotter burning and they’re lighter and easier to stir around for better airflow. We recommend Fogo lump charcoal. Like most grills and smokers, we think it’s best to start your Kamado up with a chimney starter. A chimney starter is a safe and efficient way of starting any form of outdoor cooker and especially useful for Kamados as their shape can sometimes become a hindrance when firing it up. Don’t use any form of lighter fluid when starting a Kamado as the chemicals inside the fluid can get into the ceramic and can emit toxic fumes, sometimes enough to kill. Read through our guide to using a chimney starter for all the information you need on starting your Kamado with a charcoal chimney. Once it’s lit you’re ready to start cooking. Kamados generally have little trouble keeping a regular temperature over long periods of time because ceramic is such a great insulator and the air intakes are usually enough to get it to roughly the temperature you’re looking for. But if you’re looking for a more accurate way to measure and control your temperatures in a Kamado then we recommend using a thermostatic temperature controller. These can make cooking on a Kamado a complete ‘set it and forget’ affair and you can run the oven for days on end with no babysitting required. A flashback happens when you suddenly open the fire up to a lot of oxygen. If the fire has been starved of oxygen, generally after cooking when you close all the vents, and then open the lid the sudden influx of oxygen can create the huge burst of flame you seen in the video. This can be quite scary if you’re not expecting and has the potential to cause a lot of harm. To stop this happening it’s best to open the lid slightly for 10 seconds or more to let some oxygen in then slowly open the lid the rest of the way. 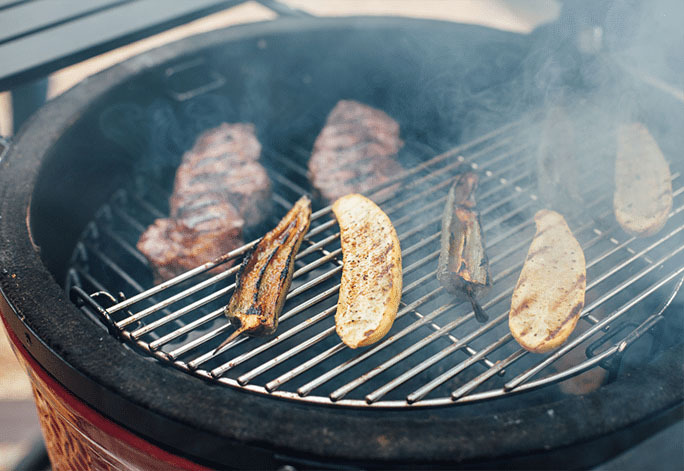 If you’re looking to get the most out of your Kamado grill you then we recommend having a look into automatic temperature controllers and using our smoking times and temperature chart to make sure your food is cooked to perfection. Being such great conductors of heat, Kamados can radiate heat so evenly that they basically regulate and hold their temperatures without any input. This is ideal if you’re looking for a set it and forget type grill or if you live in colder climates where you want to cook outdoors during the winter. Generally, most Kamados will have a very high build quality. Ceramic or steel will last a very long time and as there are very few moving parts and no reliance on technology they will be one of the most reliable grills you can buy. Their versatility is second to none. A lot of other grills provide alternative cooking methods but they tend to be dedicated add-ons to the main grill and are quite limited at that. The design of a Kamado means that you get a huge variety of cooking methods with just a few accessories. Even without accessories you can cook in many different ways, using it as a Kamado smoker for example. The food quality is amazing. Some of the best chicken and ribs we’ve tasted were cooked on a Kamado. Also, we’ve used one as a makeshift tandoor and cooked some incredible naan bread. As the walls are so good at retaining heat they generally take a long time to heat up to the optimal temperature. Once they’re there they’ll stay there for a long time. So if you overshoot your optimal temperature you’re going to have a bad time. Kamado style grills take a little more effort than gas grills or smokers. Ceramic is a very brittle material and as Kamados are very heavy it’s quite easy to crack one if you’re having trouble moving it. The steel ones don’t have this problem but are susceptible to rust. To really make the most of a Kamado you’ll need some accessories, add this to the price of a quality Kamado and you’re looking at quite an expenditure. This of course is all relative, you’re getting a high quality piece of equipment that has multiple uses and should last a lifetime. The Akorn Jr. is a triple-walled insulated, steel built Kamado that is by far the cheapest Kamado on the market. It uses 22-gauge steel to be able to maintain cooking temperatures ranging from 200°F (93°C) – 700°F (371°C). The steel has a powder coated exterior and a porcelain coated steel interior finish. You get an ash pan that makes cleaning up and disposal of ash very easy. There are also two adjustable dampers, one at the top and one at the bottom to allow a lot of control over air flow and temperature. 14” diameter caste iron cooking grate. That’s 154 square inches of cooking space. Convenient handles to allow full portability for camping or tailgating. The assembly is somewhat easy, it’ll take about 30 minutes. You will also need to set it burning for about an hour to season it and burn off any chemicals before you start using it to cook. The quality of the build is decent for the price, the instructions and manual are quite good and if you follow it precisely all you’ll be up and running in no time. This is ideal for someone looking to try out Kamado cooking or someone looking for a portable Kamado grill to take camping or tailgating. If you’re thinking of using this for home cooking we would recommend getting something bigger and a little better constructed. Having said that, this is absolutely ideal if you’re wanting to use it as a one or two person grill when you’re away from home. And at this price range you’re not going to get a better Kamado grill or Kamado smoker anywhere! Check the latest Char-Griller Akorn Jr. price. At over double the price of the Akorn Jr. the Kamander from Char-Broil is just about eligible for the budget Kamado grill category. The truth is, there are very few budget Kamados because of the build materials and the versatility of the products as a whole, but the Kamander is a good alternative to the Akorn Jr. The Kamander features a double-walled steel construction and holds its heat well, easily managing to hold a constant temperature for 6 or more hours. It has a huge 327 square inch primary cooking area with a secondary chrome plated steel 142 square inch cooking area that can swing out to provide a range of cooking options. There is also a neat little folding shelf and several hooks that provide additional ease of use. Removable internal ash pan to make clean up much easier. A top mounted intake damper to make adjusting airflow easier. Built in thermometer to keep an eye on the internal temperature. A shelf and two wheels to make mobility and storage easier. The Kamander is a bit of a weird one. It’s at an unusual price point that makes it difficult to compare to other Kamados. It has some nice features and a good cooking area but ultimately, it’s outclassed in cooking quality by the Akorn and also the price is considerably more. If you’re looking for a good home Kamado to give you an introduction into this style of cooking then this is a good option. Be aware that the construction is more difficult that the Akorn as there are more parts to it, but when you get it up and running it’s a good grill and is worth the money. The higher range Kamados will do everything this model does better and offer more accessories etc, but this is a good budget option none-the-less. Check the latest Char-Broil Kamander price. 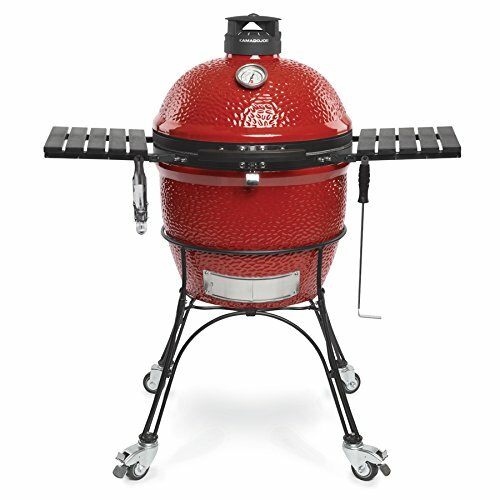 The Pit Boss Kamado is the first ceramic Kamado on the list. Being ceramic, you get the best quality heat retention which makes cooking easy and effective. It also gives a good efficiency when burning charcoal. The Pit Boss is very well made, with a top cast iron damper that gives you a good amount of control over the air flow and a nice finish on the inside and out. There’s also full stainless-steel bolts and hinges which means no rusting on the important weak points. The solid bamboo shelves are sturdy and fold down to add to the practicality. Dual stainless-steel cooking grates provide a huge 567 square inches of cooking area over two tiers. Ability to add charcoal without removing the grates. Easy ash removal tool and cover. If you’re not looking to spend too much on a good quality Kamado this is a great option. There’s many more options when it comes to cooking that are available on this model compared to the budget models. Also, being ceramic, you get the added benefits of no rust, incredible heat retention and easy heat regulation. There are some problems however, the construction wasn’t the easiest. The side tables needed additional work to get them mounted properly. There have been other reports of similar problems and general lack of quality with some of the fittings. Overall, we would definitely recommend trying out the Pit Boss, it’s not perfect but when it works it works very well. It’s got a lot of nice features and the general construction is good with a very nice ceramic core. Pick this one if you’re a little hesitant in spending more. 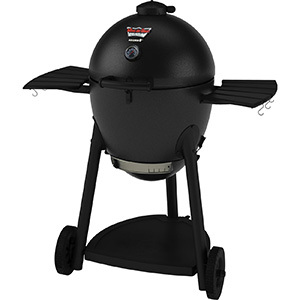 Check the latest Pit Boss Kamado Smoker and Grill price. Another Char-Griller Akorn Kamado makes it onto the list. This is also a steel built Kamado which means it comes with the benefits and downfalls of steel. It’s lighter and gets hotter quicker than ceramic but also won’t be as durable over the long term. It’s made from an outer powder coated steel with an inner porcelain coated steel and boasts a 314 square inch cooking space. The performance of this egg is surprisingly good and it’s quite similar to some of the higher end Kamados. Two foldable black metal shelves for added practicality. Like the Akorn Jr it has a well designed ash pan that makes cleaning away the ash a breeze. Will be very fuel efficient as it’s made from steel. Overall, this is a great Kamado. It’s lighter, more fuel efficient and much cheaper than some of the high end Kamados and best of all, it’s half the price. It has a few positives over the Pit Boss as well. The downfalls of it are that it is steel so will rust if it doesn’t receive proper care. Don’t expect it to last forever but do expect a lot of tasty meat with very little effort. If you’re seriously looking to try out a Kamado then this could be the one for you. Check the latest Char-Griller Akorn price. Now we’re onto the higher end models. There are a lot of very good Kamado grills out there that are around the $1000 price point but it always seems to come down to two. The Kamado Joe and the Big Green Egg. Both of these Kamados will come highly recommended from almost anyone that has used one and for good reason. We really mean it when we say you get what you pay for with a Kamado and that’s why we’d recommend forking out a little extra for a quality one. The quality of both of the high end models are top notch and will literally last a lifetime if you’re careful with them. They both have a huge range of accessories, several nifty features that make cooking an absolute joy and both come in a range of sizes. For our High End Kamado reviews today we’ll look at the 18” model of each make. 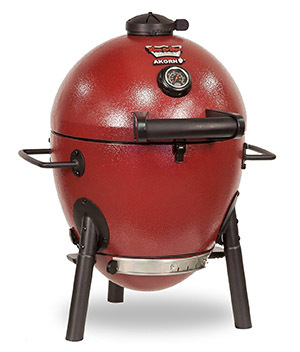 The Kamado Joe is our choice for the best Kamado Grill. It does everything right. It’s an elegant, well built ceramic grill that pays a lot of attention to the fine details that make cooking on it more functional and enjoyable. Included with it are a bunch of accessories that straight away make it the better value of the two. Our favorite is the “Divide and Conquer” system which is a unique multilevel grate and heat deflection system that comes free with this model. It works by placing grates and heat deflectors over opposite halves of the cooking area on different levels. This creates different temperatures and cooking zones in one cooker and we think is the best accessory you can own. Air lift hinge that reduces the lift weight of the dome by 96%. You can open it with one finger. It also allows the lid to remain open at any level, rather than simply slamming down when you let go. An all aluminum, no-rust control vent maintains a precise airflow and manages to keep a consistent air temperature. It has a double thick wire mesh fiberglass gasket that offers an air-tight seal and 10 times the life of normal industry gaskets. Fully stainless steel hardware means no rust and maximum quality. Sturdy wooden side tables for extra practicality. High quality removable ash tray. As you can see the Kamado Joe has everything you’ll ever need. 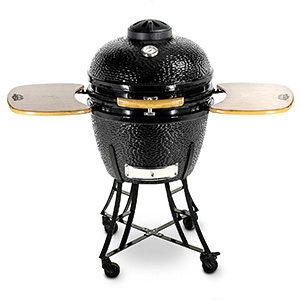 It’s a Kamado of the highest quality and even comes fully assembled. Even at quite a high price point it is still excellent value for money. The fact that you get several accessories included, all of equally high a quality just makes it a no brainer. We love the Kamado Joe! Check the latest Kamado Joe price. If you need more information, check out our Ultimate Guide to Buying a Kamado Joe that covers everything you need to know about purchasing one. The Big Green Egg is basically the industry standard in Kamados. It’s been one of, if not the best Kamado money can buy for a long time. They’ve stuck with the formula, whilst slightly refining it here and there. A lot of competitors have actually designed their Kamados to fit the Big Green Egg accessories. You buy just the egg, though, everything else is going to cost extra. If you already own the extra accessories then that makes the competition between the BGE and the Kamado Joe a lot tighter, but we still think the Kamado Joe wins it. The Eggs are all high quality ceramics that can easily reach very high temperatures. They have two dampers for accurate control of the inside temperature and can easily be kept at a specific temperature for set it and forget it cooking. Patented precision flow draft door which controls the air entering the front of the fire box. If you want to buy one you’ll probably have to go into a dealer as they aren’t sold on the internet. We think this is a big business misstep as a lot of people enjoy the ease of ordering from their own home.This however, doesn’t seem to have done any harm to their sales numbers. If you decide to buy an Egg you’ll still be getting one of the best Kamados on the market. They’re tried and tested, have a huge following of passionate fans and are one of our favourite way to cook. But we think there are better options if you’re new to Kamados, specifically the Kamado Joe. 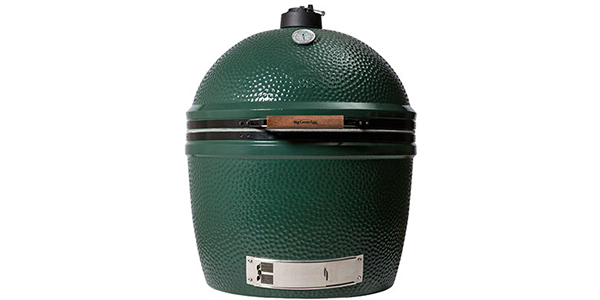 Check the latest Big Green Egg price. There we have it, the Big Green Egg is outclassed by the Kamado Joe, which beats it to the top position in our Best Kamado Grill list. This is, of course, just our opinion. Let us know what you think in the comments below or on our Facebook page.